-----Rivers and time flow. So do lives. Lives are punctuated. Sometimes by happy events, sometimes sad. Our memories are usually composed of those moments. They remain, as though captured on film, in our memories. ----- So it is with rivers. Locks punctuate rivers, usually with commas, sometimes with an exclamation point, and always with a question mark. -----Life has many interesting parallels for us. We are river people. When younger, that meant canoes, kayaks, rafts and sport-yaks down the top-ends of some of our continent's finest rivers. These included the Colorado, Green, Rio Grande, Missouri, Snake, Salmon, San Juan, Willamette - the ones most western river folks know and love. But, they also included every river in Rhode Island. Yes, those in little Rhodie were all one-day trips, but their beauty rivaled that of any river we know. On the long western rivers, most trips were at least a week, often two, and one as long as two months. We were school teachers, remember, and those precious vacations often found us "running another river." 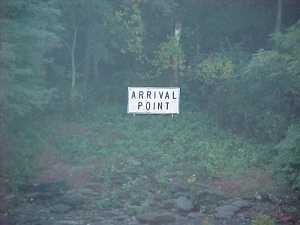 -----The upper reaches of rivers are usually marked with rapids. A fellow boatman described, as only a river runner would, our 14-day journeys through the Grand Canyon as "long periods of boredom interrupted by short stretches of terror." But, in those younger days on the youthful headwaters of rivers, we relished those rapids. They were the ultimate challenge of our skills in "reading" the river - of keeping not only our crafts, but oursellves, under control. They were heart-thumpers. -----Now, in our Halcyon Days, we are older and we run on the lower, slower, older, stretches of rivers - sometime the lower ends of the same rivers we paddled in our youth. The bottom ends of the rivers in our lives today are interrupted not by rapids, but by locks. A come-down you say? Try one! -----We have been on Halcyon for two years now, and cruised over ten thousand miles of America's rivers, lakes, and coasts. One common experience, we have had in every part of the country, has been locking through. On our little boat, we have been lifted up a total height greater than Mt. Washington, and dropped farther than the depth of the Grand Canyon. We know one thing about locks - like a person, every one is different. -----Before entering, we learn all we can about the lock, just as we formerly scouted every rapid - even ones we had traversed dozens of timess. The first information we need is the location. 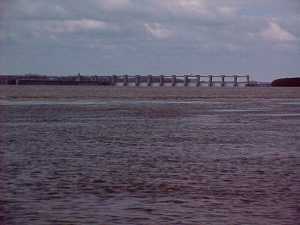 Dams across rivers are often wide and massive barriers, sometimes a mile or more wide. Locks can be anywhere, left or right or even in the middle. Check the chart or radio the lock tender, if in doubt. -----You don't want to make the fatal mistake an Oregon couple made on the Willamette. 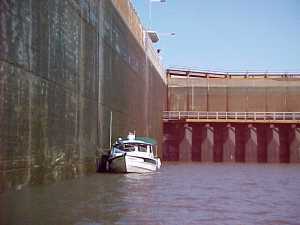 They thought the locks were right bank descending. Wrong! They went over the falls, and it cost a life. -----The second bit of data we need is their drop. On a two-foot drop on the St. Lawrence, we didn't even tie off. With the lock master's permission, we just puddled around in the middle. 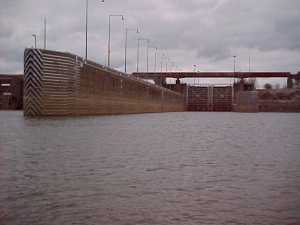 One of the Tennessee River locks is 93 feet, the second highest in the U.S. 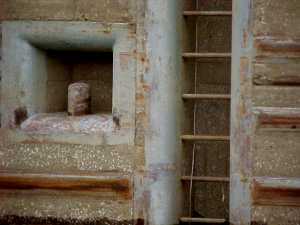 If you're locking up anything over ten feet, the swirling water entering the lock from below can be a challenge when you're fending off wet, slime-covered walls. 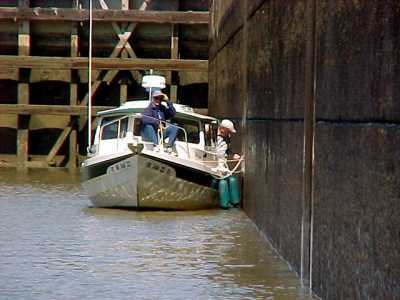 A sailing friend lost his grip (literally and figuratively) locking up one of the Tennessee River locks, badly damaged his boat and came close to wrecking it. It certainly wrecked his wallet! -----El radios the lockmaster when we are about 10 minutes away. Her standard question is, "Which side of the lock do we take?" We need to know in order to put the fenders and lines on the proper side. 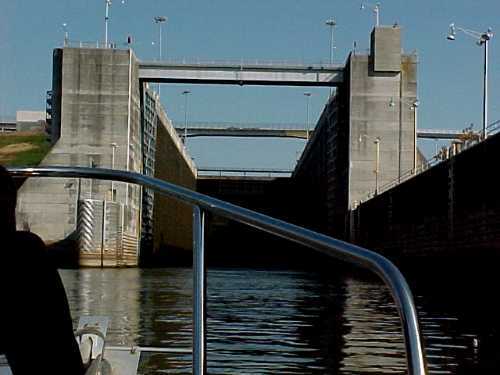 In most locks, it makes no difference which side we are on - but on some, all the entering (or exiting) water travels through pipes on one side of the lock only. 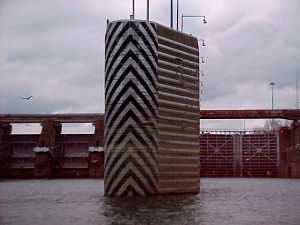 That means an asymmetrical flow of the water in the lock. If you are ascending, on one wall you are pressed against the cement - on the other side, the current pushes you off the wall. It is all your arms can manage to hold onto the lines to keep from being torn loose into the swirling water. 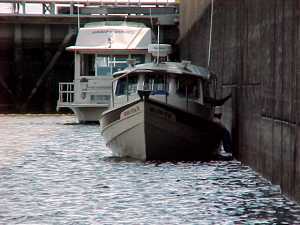 -----Some locks have auxiliary chambers, a second, smaller lock used by a short string of barges or by pleasure boats. 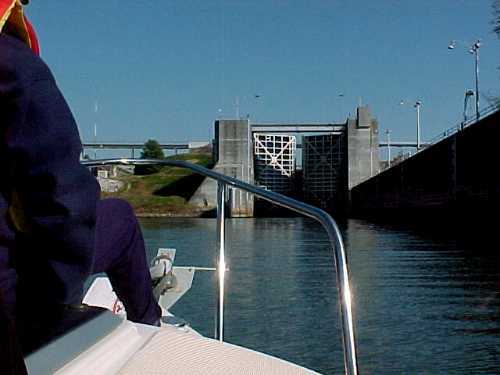 You need to carefully check the charts to see which side of the lock contains the auxiliary chamber, and then identify the proper entrance by sight - or radio the lockmaster for his information and advice. 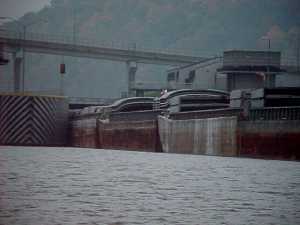 -----Locks usually have two long walls extending outward from the gates. 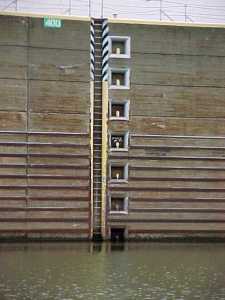 Tows slide or winch their barges along these walls to line their string of barges into the lock. If there is an auxiliary lock, there are three walls. 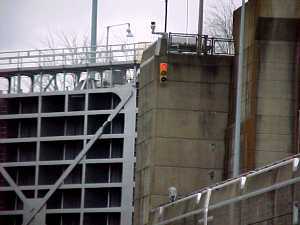 Two are long and guide you into the main lock. The third is short, and, together with one long wall, guide you into the auxiliary. The ends of the walls are often striped and lit to make them easy to see. Rivermen refer to the blunt, zebra-striped, end of the wall as the "bull nose." -----Then, there is the major factor of wind. 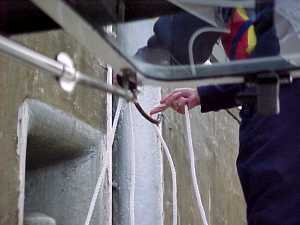 Inside the enclosed box of a lock, a strong wind creates aberrant currents that will take control of a boat if the skipper loses it. An aft wind is a devil wind - the only comparison I can make is to a down-wind landing in a small plane, with gusty cross winds. You're moving too fast for a safe landing, and the side winds deflect you from your point of contact. Fortunately, locks, like airports, have wind socks. They give you an idea, before landing, of what problems wind might impose on your landing. -----Winds also can mean waves. 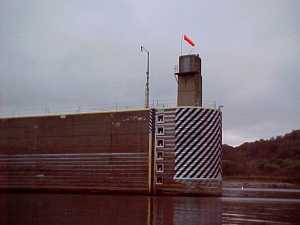 The open door of the lock and the long concrete control walls focus waves. 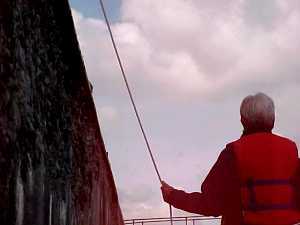 Riding a small boat into an open lock on a windy day can be like riding a bucking horse. Fortunately, when we lived in Nevada, El rode rodeo. Straddling the bow, she can keep a sure-footing. And with her alert eye, she has a good toss of the line. 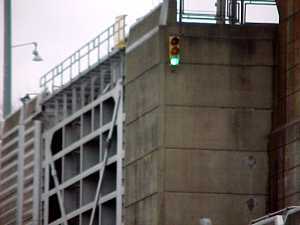 -----Locks have blinking traffic lights. The lock master switches on the green when he thinks it is safe to enter. 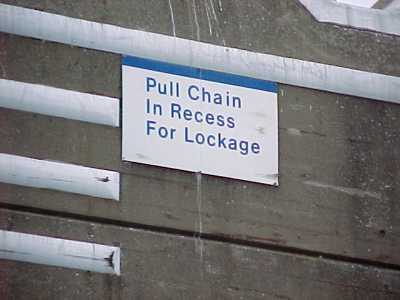 -----If you don't have a radio to call to the lock master, there is a pull chain to get his attention. The first time we pulled a chain was our first time through a lock. -----We were in a canoe, paddling the Willamete in Oregon. We were faced with a flight of four large locks ahead. With trepidation, El pulled the chain. "YES?" said a huge voice from somewhere deep in the earth. When the sound stopped echoing through the hollow of the lock chamber, El ventured a reply. 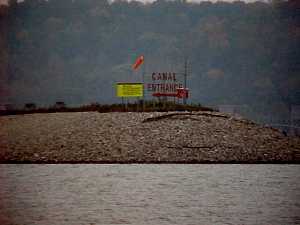 -----"We are a canoe and would like to lock down. Please?" she added. -----"PROCEED" came the rumbling, vibrating, echoing reply. 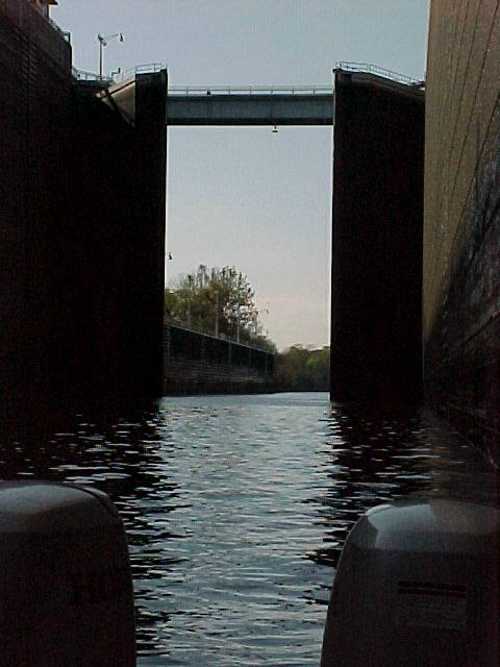 We had heard the voice of the Almighty, and with trembling arms, we paddled into the yawning maw of the open lock. It was an experience never to be forgotten. -----A most important question is what method is used in the lock to fix us to the walls? If we are uncertain, El asks the lock master before we enter. Some have ropes hanging down the insides of the lock at periodic intervals. El, up on the bow, grabs one and I try to maneuver the boat to grab the next one from the stern. We clutch those lines with a grip that often leaves our hands cramped and aching. 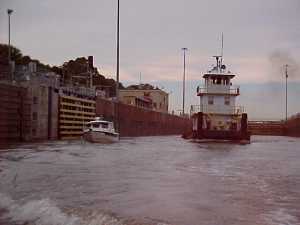 Coming up, the currents in the lock swirl and the boat may try to spin like a dervish. One hand grips the line, the other fends us off the wall. 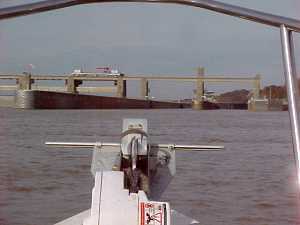 -----On the Upper Mississippi, the lock tenders drop two lines to you, one to El on the bow and the other to me in the cockpit. They thoughtfully swing them out to make them easier to catch. El often chats with the lock tender as we descend. The conversation ends as we drop down out of voice range and they disappear behind the rising, wet wall. 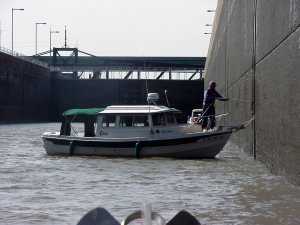 -----On the Upper Ohio, the lock tenders also drop you a line - but here things are different. Fixed to the end of the line is a hook, over which El draped the middle of a hundred feet of our line. 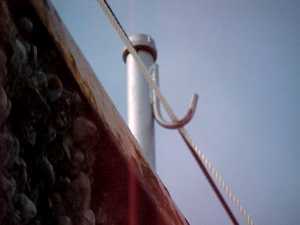 The tender pulled up our line and placed it over a hook on the rail at the top of the wall. 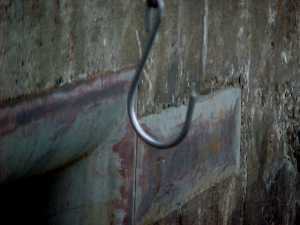 Sometimes, he stretched the line between two hooks on the wall, spaced thirty feet or so apart. El held both ends of our lock line, keeping us steady against the wall for the descent. As the lower gate swung open, she released one end of her line and pulled the other to slide the line through the hook, now high on the wall above her. Ducking the flailing free end as it fell to the foredeck, she then quickly wrapped the line to be certain no trailing end would foul the propellers as we left the lock. 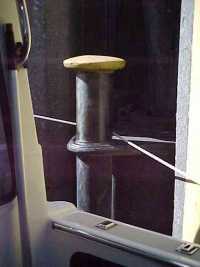 -----Most locks do not have lines from above. Instead, you tie off to a bitt. Bitts come in two types - fixed and floating. Don't ever use a fixed bitt, since you would have to take your line off and reloop it on the next bitt as you either ascend or descend the lock. 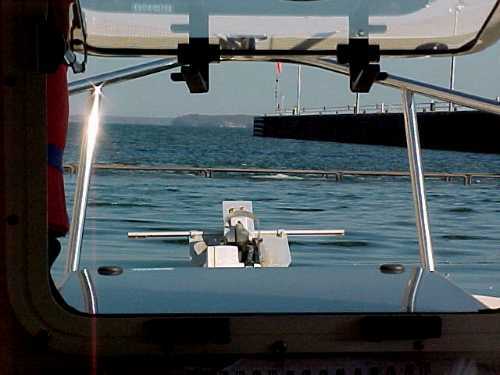 -----We use floating mooring bitts, and a clever contraption they are! These are great metal drums, recessed into the wall, that slide up or down vertically on wheels in their slots as the water level changes. They have a tie point atop the drum. We cleat a lock line around the aft cleat, and El takes the rest of the line forward to the bow. As we slowly approach the bitt, she drapes the lock line around the bitt and holds the free loose-end of the line in her hands. 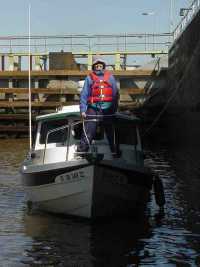 She can adjust the tension on the line by pulling, holding the boat alongside the wall. We both fend off the walls with our gloved hands to keep the boat from the rough slimy wall. 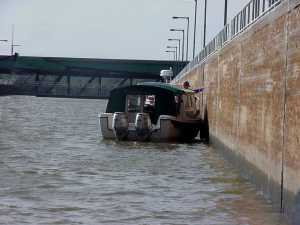 -----El doesn't have to pay out the line, since the bitt drops down the wall at the same rate as the boat descends. By the way, she has become an expert at lassoing the bitt with her lock line. However, on the few occasions when she has missed, it is exciting until we get the boat under control and back to the bitt. 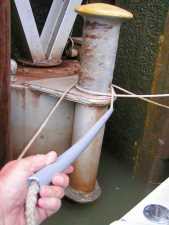 ----One couple made the mistake of fixing both ends of their lock line to cleats, after passing it around the floating bitt. 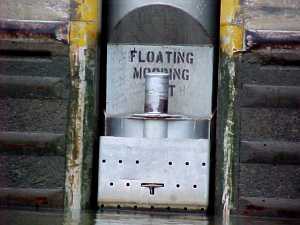 Unfortunately, the floating bitt, instead of dropping with the boat, was rusted tightly into its slot. As the water dropped, the boat was tilted sideways against the rough wall, and left hanging by the ever-tightening line. The tension on the line was so great, they couldn't uncleat it from their boat. Before they scrambled for a knife to cut the line the lower rail went under water. They cut the line just as they heard the sound of water pouring into the cockpit. The next sound was ripping fiberglass sliding down the rough wall. That sound must have been almost as grim to hear as the repairman later quoting the cost of repairs. Lesson: DON'T CLEAT BOTH ENDS OF A LOCK LINE! ----We stay against the lock wall until the lock master gives a toot on the lock whistle to let us know we have permission to leave. Then, we usually give an answering toot with our horn and radio our thanks to them as we leave the chamber. Sometimes, we get "pushed" out the chamber. ----So, here on Halcyon, running rivers, we have our "long periods of boredom interrupted by short stretches of terror" just as in our younger days of river running -- only now the heart-thumpers are locks, not rapids.